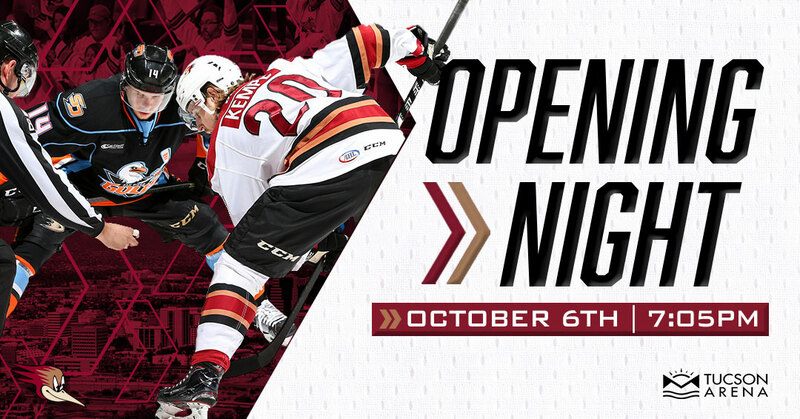 TUCSON, AZ – The Tucson Roadrunners, proud American Hockey League affiliate of the Arizona Coyotes, officially shared details today for the club’s 2018-19 home opener. On Saturday, October 6 the team will face the San Diego Gulls at Tucson Arena with puck drop set for 7:05 local time. The Pacific Division rivalry series, which was officially established prior to last season, places the two sides competing against one another for the “I-8 Border Trophy”. Tucson claimed the award last season by registering a 7-4-0-1 record against the Gulls, totaling a score of 15-10 in points. This also marks the third consecutive season the club will open their campaign against San Diego. The 2017-18 season opener was record-breaking for the Roadrunners with the two teams combining for 13 goals, the highest scoring game in team history. A complete schedule for the 2018-19 American Hockey League season will be released within the coming days. For tickets and more information, visit the team’s offices at 175 W. Broadway Blvd. in Tucson or call 866-774-6253.